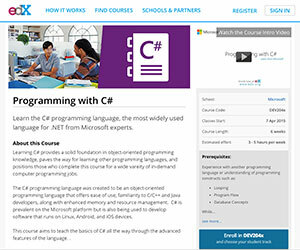 In a first for both companies, edX and Microsoft have partnered to launch IT development courses on the edX online learning platform. Taught by Microsoft experts, the courses focus on core development skills for cloud and mobile technologies, and feature interactive coding, assessments and exercises. Students can enroll for free or obtain a verified certificate for a fee. Enrollment opens today, with courses beginning at the end of March. Windows PowerShell Fundamentals (part of the edX Professional Education series; requires additional fee). "We are pleased to welcome Microsoft to edX," said Anant Agarwal, CEO of edX, in a press release. "Microsoft has already made significant contributions to the edX platform by developing an XBlock that enables course creators to embed Office Mix lectures into their edX courses. With these new MOOCs, millions of edX learners around the world will gain important technical skills to excel in their careers." "Microsoft has a long history of working within the community to make coding and app development more accessible and rewarding to the growing number of people who want to help shape the technology industry," said Steve Guggenheimer, corporate vice president and chief evangelist, developer experience at Microsoft, in a statement. "Together with edX we can provide new opportunities for students and developers from around the world to create innovative applications, services and experiences that have a meaningful impact on today's mobile and cloud centric world."